Since we opened the doors of Campus Warsaw in 2015, we’ve worked hard to foster innovation in the startup and developer communities in Central and Eastern Europe. Campus, a place for entrepreneurs to grow and connect, has hosted more than 560 events and 9,000 members have joined the community--in fact, so many people have visited Campus (over 21,000! ), that we’ll soon move to a larger building. Even before Campus’s launch, we’ve worked closely with developers in the region. Google Developers Ecosystem team supports hundreds of events each quarter and over 83,000 developers in the region have joined Google Developer Groups. This week we’re taking another step forward in CEE for even more meaningful support of the growing startup community. We’re excited to announce three new programs for entrepreneurs in Central and Eastern Europe, including Launchpad Start, Campus Warsaw's Residency program and Launchpad Accelerator. Each program is tailored to address the biggest challenges surfacing startups from the region at various stages of growth, including finding the product market fit, expanding to new markets and customers, growing revenues, and, most importantly, scaling globally. Launchpad Start is a one-week bootcamp for early stage startups focused on critical startup topics: product strategy and business development, user experience and user interface, technology, marketing and presentation skills. On 24th April, startups will start the first edition of the program at Campus Warsaw, when we will welcome 10 early-stage startups and more than 50 mentors to work with the teams. The program is both cost- and equity-free and is open for all CEE entrepreneurs. 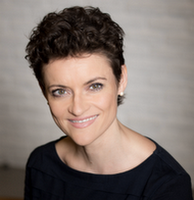 With a goal of teaching first-time entrepreneurs techniques to quickly validate product-market-fit quickly and to build a company for scale, participating startups benefit from intensive 1:1 mentorship sessions with experts as well as group training sessions both to network and to address specific startups needs. Interested startups can apply here till 2nd of April. Campus Warsaw's Residency program is a six month support program for growth-stage startups across Central and Eastern Europe. Participating teams have the opportunity to work from Campus Warsaw's coworking space where they’ll benefit from both expertise and mentorship from Campus’s network of experts. In addition, Resident startups will be offered tailored education and trainings, and access to our international network of partners. The goal of the Residency program is to identify top challenges that startups must overcome to grow exponentially. The Campus Warsaw team will focus on helping selected startup significantly grow their revenue, number of customers, and international opportunities. The program is cost-free and equity-free for startups. Interested startups from around Central and Eastern Europe should apply using this form until 11th of April. The first residency cohort will begin in June. 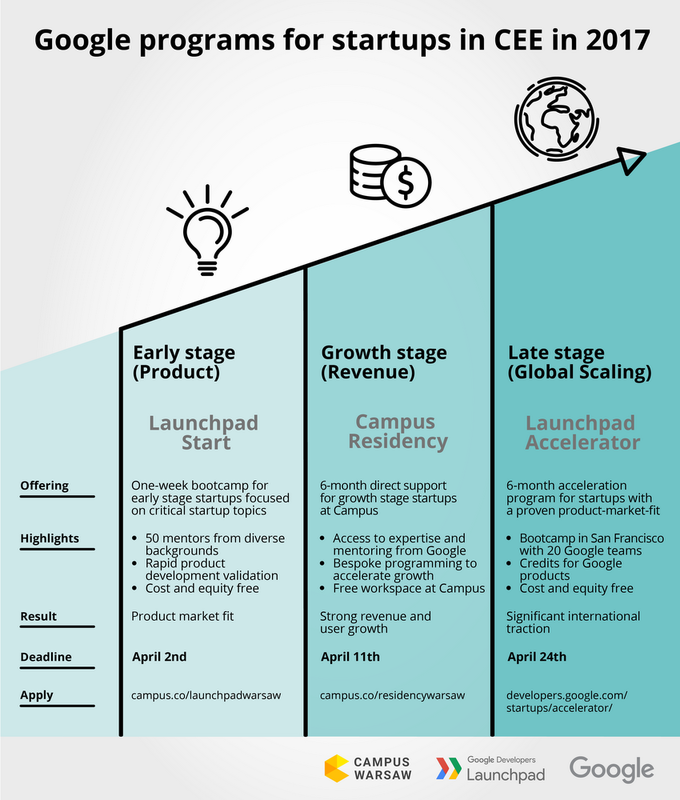 Launchpad Accelerator is a six-month international acceleration program organized by Google Developers for startups with a proven product-market-fit looking for their next million users. Applications for the 2017 session are being accepted now, and for the first time the program is open to entrepreneurs from Europe--and specifically in CEE, Poland, Czech Republic and Hungary. Following this session, each team will also receive 50,000 USD in equity-free support, credits for Google products, and guidance from Google experts in their home country throughout the six month period. Startups can apply using this form through the 24th of April. With more than one million highly-skilled developers in the CEE region-- including Poland, Ukraine, Czechia and Slovakia, which together count more ICT graduates per year than the United States-- we know the talent is here, and we want to support them in becoming successful entrepreneurs. We hope that those programs will help startups from Central and Eastern Europe in reaching new customers from all over the world, resulting in CEE tech brands being recognized globally.